McALLEN — The wife of a Mission doctor accused in a healthcare fraud scheme met the same fate as her husband did just a month ago. On Monday, U.S. District Judge Ricardo H. Hinojosa denied bond for Meisy Angelica Zamora, the wife of Dr. Jorge Zamora-Quezada, 61, who faces healthcare fraud charges and was himself denied bond in early September. Meisy Zamora, along with her attorney, Christopher Sully, stood before Hinojosa Monday to hear his decision on her release, which was based on arguments Sully made earlier this month on her behalf, and again briefly Monday afternoon at the continuation hearing. Hinojosa ultimately ruled that Meisy Zamora is too much of a flight risk to consider her for release on bond. The government prosecutor, represented by Andrew R. Swartz, argued during the hearing Monday afternoon that Meisy Zamora, originally from Mexico City, is a flight risk because of her close of ties to Mexico, including relationships, multiple bank accounts, and other substantial properties that continue to provide her with an income. Meisy is also not a U.S citizen, unlike her husband, Zamora-Quezada, who is a naturalized U.S. citizen. Meisy Zamora has been in federal custody since July 27, when federal agents arrested her as she arrived to support her husband for one of his scheduled court appearances. Zamora-Quezada was arrested in May. Hinojosa made a similar ruling during Zamora-Quezada’s bond hearing in early September, also saying that because of the defendant’s ties to Mexico there were no conditions that the court could impose to ensure the doctor’s appearance in court for subsequent hearings. During Meisy’s hearing, the deciding factor appeared to be a phone call between Zamora-Quezada and his daughter on June 15, approximately a month after his arrest on healthcare fraud charges. Swartz said in the phone call, which was made by the daughter to the jail where Zamora-Quezada is being held, and recorded by the jail, as is protocol, Zamora-Quezada asks about Meisy’s whereabouts, to which the daughter says she’s over there, referring to Mexico. According to the prosecutor, the daughter conveyed that Meisy had left the country because she was afraid of being arrested along with Zamora-Quezada. On June 29, records show Meisy returned to the U.S. from Mexico, with prosecutors saying she may have been in Mexico for as long as three weeks. She was subsequently detained and arrested at the aforementioned court hearing for her husband. Government prosecutors say that for nearly two decades, beginning in 2000, the doctor’s wife participated in an alleged scheme to provide unnecessary treatment to patients in order to defraud health insurers. 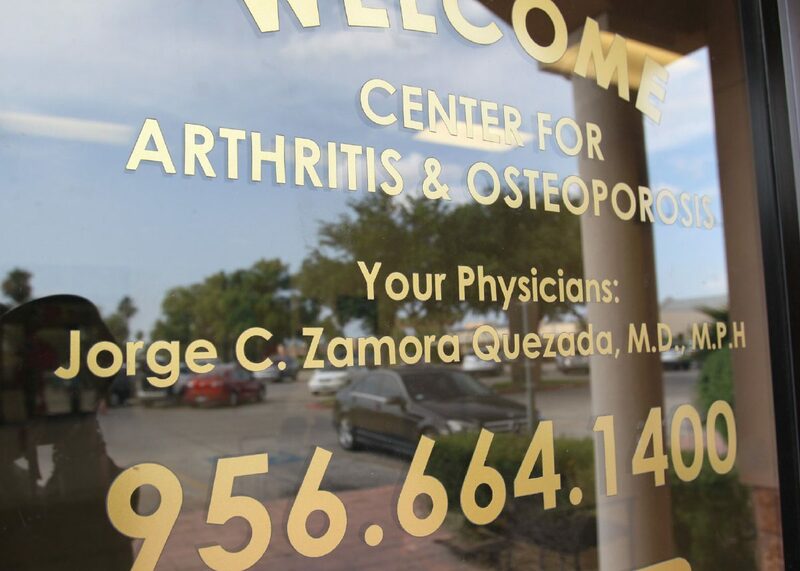 She worked at the time as a supervisor at her husband’s practice, the Center for Arthritis & Osteoporosis in Edinburg. A manager told investigators that Meisy Zamora was actively involved in supervising employees who raised complaints with her about having to meet quotas for medical procedures due to fear of raising them with her husband. Also named in the indictment were two of the doctor’s employees who helped manage the doctor’s finances — Edinburg residents Estella Santos Natera, 45, a billings supervisor, and Felix Rodolfo Ramos, 42. They are accused of helping the doctor and his wife in the healthcare fraud scheme. The government accuses the doctor of giving false diagnosis to patients in order to file those claims. Santos Natera allegedly helped the couple by submitting false claims and falsifying patient records that made it seem as if certain procedures were medically necessary and that those procedures had been performed. It is also alleged that she helped them obstruct investigations by creating false records to be provided to the grand jury. The money made from the scheme, according to the government, was used to enrich them and Ramos, the second employee in the indictment, who is accused of assisting the couple in concealing the source of those funds. Ramos allegedly conducted financial transactions knowing they were meant to conceal the source of the funds and helped transfer money to Mexico by funneling money to other bank accounts, according to the indictment. Meisy Zamora will remain in custody pending her future court hearings.